Cembre 2A-2M are high voltage cable lugs that manufactured from high purity copper tube, annealed and tin-plated designed for HV applications up to 33kV. The extended barrel enhances electrical and mechanical performance in heavy duty applications. The absence of an inspection hole prevents moisture entry into the crimped joint. Featuring an extended palm with two fixing holes at 44.5mm centres. Other configurations are available upon request. 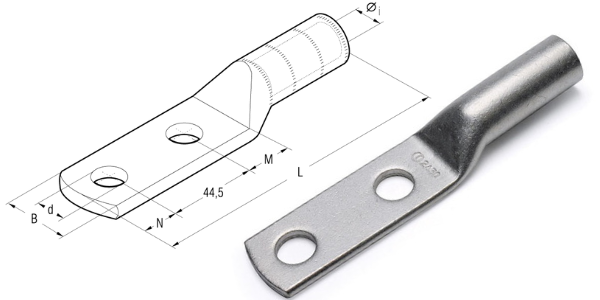 The cable lugs are annealed to ensure ductility and satisfactory performance when subjected to deformation and vibration and are electrolytically tin plated to avoid oxidation – compatible with both Cold Shrink and heat shrink cable joints. ➡ For correct crimping tools and die sets please contact Thorne & Derrick Sales.